Temple Beth El is honored to present the 2018 Fred Weisman Tikkun Olam Award to Alyssa Goldberg at its Annual Membership Meeting on May 23. 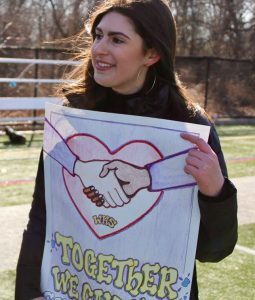 A junior at Westhill High School and daughter of long-time congregants Bruce Goldberg and Vivian Rich Goldberg, Alyssa was a lead organizer and speaker at the Stamford March for Our Lives on March 24. She was also the co-organizer of the walkout at her school that was held to remember the tragedy in Parkland, Florida, and to protest gun violence. Alyssa is an executive board member on the Mayor’s Youth Leadership Council (MYLC) at Westhill, focusing specifically on mental health issues in school. She serves as a board member on the Westhill Feminist Club and is the social media manager. She is also a reporter for Westhill’s The Westword, writing on topics ranging from limitations on birth control to upcoming music festivals. Alyssa celebrated her Bat Mitzvah at TBE in May 2014 and graduated from the Religious School the following month. She is an active member of USY. This year, when students across the country are leading the way in advocating peacefully for their political beliefs, TBE recognizes Alyssa’s efforts to ensure the safety and security of all Americans. The Fred Weisman Tikkun Olam Award is given to a person or persons who embody the spirit of Tikkun Olam (world repair). The award is in memory of Fred Weisman, z’l, a beloved TBE member whose life was filled with acts of caring and loving kindness.